Our Last major Elliott-Wave Analysis of Gold came in early September when Gold had touched the $1434 area, and in that analysis we called for a re-test of $1271-1285 levels. This was based on our Elliott Wave Analysis of the patterns involved since the $1923 spot highs in the fall of 2011. Our clients of course were updated on a regular basis since that public analysis and we have been looking for clues to a bottom in this Gold bear cycle from the 2011 highs. Most recently, we noted that we are seeing patterns commiserate with what Elliott wave theory calls a “truncated 5th wave” pattern. All Bear cycles have 5 full waves to the downside from the highs, and we have been in wave 5 since the $1434 highs. The key then is determining how low that wave 5 will take you in Gold, and planning your investments and timing around that forecast. To qualify for a truncated 5th wave, you have to have a very strong preceding 3rd wave to the downside. In this case, we had that as Gold dropped from just over $1800 per ounce to $1181 into late June 2013. As we approached the $1181 areas, we also put out a public forecast saying that Gold has indeed bottomed and should rally strong to the upside. Recently, Gold hit a bottom at $1211 spot pricing last week and that is when we began to consider a truncated 5th wave pattern. If we fast forward a week later, we had Gold running up to $1261 which was the pivot resistance line we told our subscribers to watch for. We hit it on the nose and backed off to $1224 yesterday. We now expect that if GOLD holds the $1211 area, that we will again rally back up and over $1261 and then head to the $1313 resistance zone. We would like to see Gold get over 1313 and if so our targets are in the $1560 ranges for Gold in the first half of 2014. Aggressive investors should be accumulating quality small cap gold producing and exploration, or Gold itself depending on your preference during these last few weeks of December as our Elliott-Wave Analysis is signaling a bottom is near. We would again watch $1211 as a key level to hold for this possible truncated wave 5 to work out. 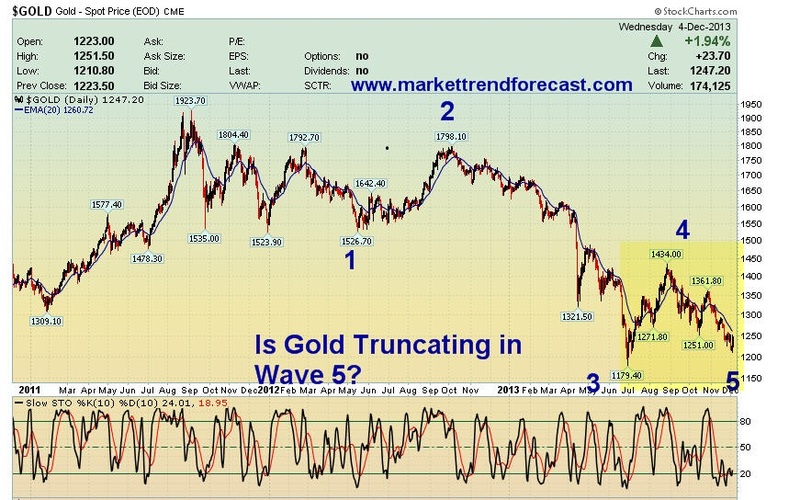 Join us at www.MarketTrendForecast.com for regular Gold & SP 500 Elliott-Wave Analysis updates.